I’m crazy about Star Wars, and one of my favourite characters is R2-D2, that little droid that plays a vital role in this great story. Now Think Geek is selling this incredibly detailed R2-D2 replica from Japan, which is not at all what it seems. 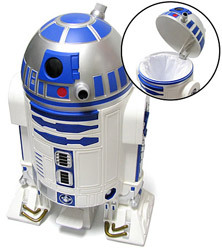 This R2 unit doesn’t have any sounds or lights or special effects, but if you’re looking for a trashcan, this is one of the coolest I’ve ever seen. When you step in to his central “foot”, it swings the dome open to reveal a trash bin, making it the perfect companion to your office. With the R2 wastebasket you’ll find that throwing things away can be also fun, just be careful not to dispose of anything important. The droid stands 24″ tall, and it costs US$ 149, which may be a little expensive for a trashcan, but is a small price to pay to get all your friends jealous. If you want one you can buy yours now from Think Geek, but hurry up, because this Star Wars R2-D2 Trash is a limited edition Japanese imported collectable and when it sells out there will be no replacement. Available from Think Geek found via Gadget Garden. that is a cool trashcan, i am not a star wars fan myself, but I would not mind having a similar one on my office!